JPGroove is having another Sample Sale this weekend which you can read about in more detail here, I strongly encourage you to check it out if you have not already as there are still a lot of great deals. I thought I should take this opportunity to feature one of the dolls that was purchased during the last Sample Sale. Isul Cedric belongs to Requiemart but he visited me briefly as we had ended up tacking dolls on one another’s orders so we could hit the necessary amount for free shipping (orders of $175 or more qualify for free shipping within the US). I was given permission to photograph him during his stay here so I could share him here….. This empty classroom is a secret room that I inherited from my senior…I’ll only confess to you… situation like so. Isul Cedric is a part of the School Diary series alongside Taeyang Ethan and Pullip Eloise, who I previously reviewed here. 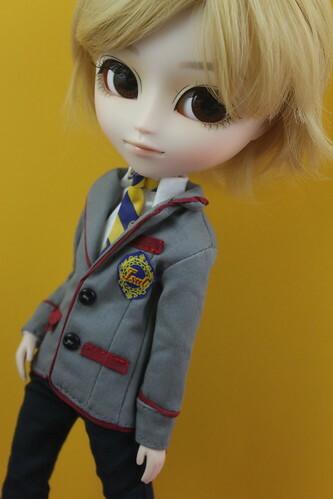 Unfortunately no corresponding Dal or Byul were ever announced or released in this series, I think Byul would have looked particularly adorable in a school uniform. Cedric was released in October of 2013 and had a MSRP of 13000 yen. I’ve always been somewhat taken with Cedric so I was grateful to get a chance to handle him though now that I have, I feel like I’m doomed to end up ordering him myself one day. 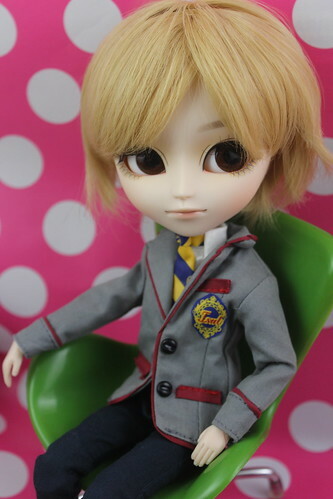 I do not have any box photos of Isul Cedric because he was purchased through the Sample Sale, he also did not come with his box and stand though if you are interested in that sort of thing I’ve heard he originally came with a black stand. 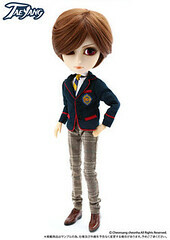 Isul Cedric does not come with any accessories, his stock consists of a blazer, shirt, tie, shoes and pants. 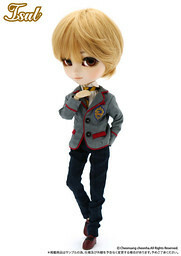 He does look quite good in his school uniform! He looks like he is a top student of a prestigious boarding school. Cedric has one of the most natural Isul face ups. While I love the dramatic face ups of Classical Mad Hatter and Midnight Deju Vu, Cedric probably has one of the most realistic face ups of the Isuls which means he looks more like your typical teenage boy. 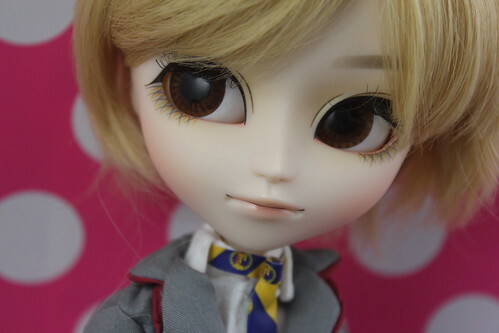 The face up itself is very nicely done, I especially love the detailed eyelashes. 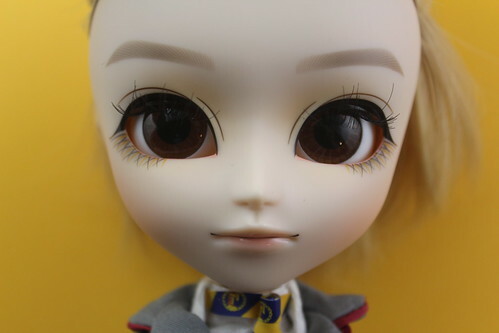 I also love that he has somewhat of a wide eyebrow, it’s different than what we normally see on the dolls who almost always seem to have somewhat stylized eyebrows. His lips are a nice neutral shade too! He has soulful brown eyes. I think he has the potential to be extremely versatile and would look great in a lot of different looks. 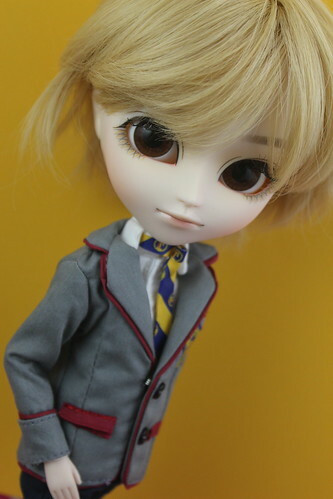 His wig is a pale shade of honey blond that I absolutely love and it is extremely soft. It’s a pity there was no Dal released in this series after all as I could definitely see a schoolgirl themed Dal falling for Cedric and the adorable photos that would ensue. With his sister Pullip being the only girl released in the line, I’m kind of pondering his feel like so as he seems to be talking about confessing his feelings perhaps Taeyang Ethan is the object of his affection? Cedric’s blazer features a crest with his name on it versus a school logo which would typically be there. 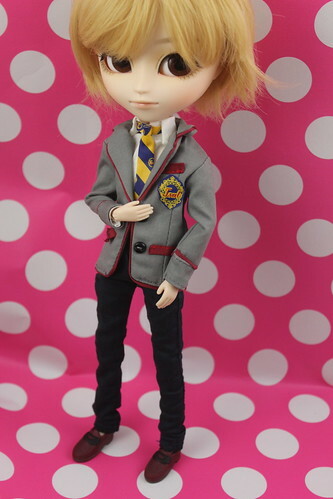 I actually quite like the colors they used for his school uniform, the red piping really makes his outfit pop and stops it from being a bit too dull as so many school uniforms are (I know they are designed to be that way >_<). 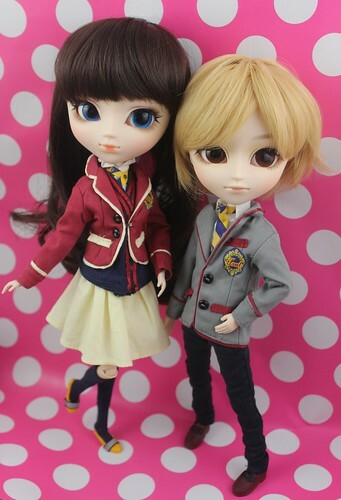 Isul Cedric with his big sister Pullip Eloise! These two look so cute together, it’s a shame that Pullip Eloise has become somewhat hard to find recently. Of course, I could not resist snapping a selfie style shot of the pair while Cedric was here! 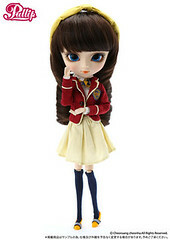 This entry was posted in isul, Pullip and tagged 2013 Isul, asian fashion doll, cedric, Doll, eloise, fashion doll, isul, jpgroove, not my doll, Pullip, sample sale, school diary series. Bookmark the permalink.